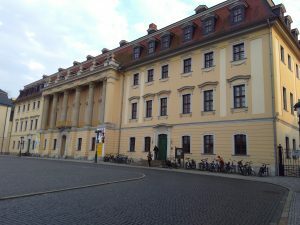 I’ve just returned from a week in Germany, on the jury of the Joseph Joachim Chamber Music Competition in Weimar (see photo of the splendid Music Conservatory where it all happened). There were groups from most corners of the world. Many of them were living proof of the benefits of cross-European study. Although there were a few groups whose players came from the same country, it was actually more common to see names from three or four different nationalities. This is because since the 1980s it has been easy (and cheap, if not free) for people from mainland Europe to come to study in London, and for Brits to study in Amsterdam, Madrid, Berlin, Vienna and so on. In Weimar there were a couple of groups ‘from London’, but in fact their members were (for example) Swedish, Dutch, Bulgarian and German as well as British. All have been able to take advantage of Erasmus and other reciprocal schemes which facilitate study across Europe. The result is a lively mix of people who have developed mutual tolerance as well as a wider spectrum of musical styles and approaches. As Brexit approaches, and with it the prospect of these schemes closing a) to British students wanting to study in the EU and b) to European students wishing to study in the UK, I must say I spent a lot of the week contemplating the young chamber groups with a sense of poignancy, almost a feeling of sorrow for something about to be lost, or at any rate made harder. Some of the best music-making was by groups with diverse nationalities. That cannot be a coincidence. Offering young musicians a taste of life in other countries and of other cultures’ attitudes to music has been hugely beneficial. They make friends and forge working relationships across Europe. It seems to me that without exception they become more open-minded. Let us hope that whatever happens, ways will be found to keep open these educational pathways which lead to mutual understanding. I did some guest teaching at the University of St Andrews the other day. During one of my sessions, a member of the audience asked an interesting question. I didn’t know the answer and am still thinking about it. He said: ‘I have some modern recordings of Baroque music. The orchestra plays with a lot of swing and bounce. The tempos are fast. It makes you want to tap your toes along with the music! ‘I wonder though whether this entertaining, toe-tapping style is something modern, something that has developed since the jazz age, the swing era, and all that. Obviously that music is in our blood now, so maybe it’s natural for today’s musicians to try the style in old music as well. I said what came into my head: that we can’t know for sure how long-ago musicians played, nor how audiences reacted. There are no 18th Century films or sound recordings, so unless we have first-hand descriptions, we can only speculate. But my guess would be that in every era, especially with music which originated as dance, people would have enjoyed tapping their toes along with the music. 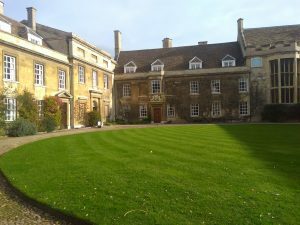 Of course Baroque audiences might have been restrained by the setting they found themselves in – the church, for example, or the formal atmosphere of the court. Even today we are held in check by that sort of context. Apart from that, however, I’d guess that musicians have always hoped to get their audiences’ toes tapping, and listeners have always been happy to respond. The season of Seville oranges has come to an end and with it the chance to make Seville marmalade, by general consensus the tastiest of all marmalades. We have tried making others with ‘ordinary’ oranges combined with lemon, grapefruit or lime, but nothing quite matches the tart, slightly sour aromatic tang of the Seville orange. Bob has been busily at work making batches of marmalade. 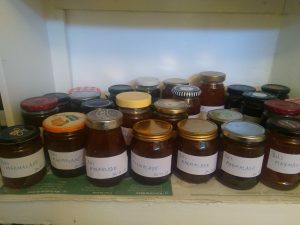 His aim is to get us through the whole year with home-made Seville marmalade, never resorting to the shop-bought version – which, frankly, is a pale substitute once you’ve tasted the real deal, the orange peel lovingly and painstakingly cut by hand while listening to umpteen radio programmes. There are about 40 weeks until the next Seville oranges appear, so we can make it with 32 jars unless we get carried away, or the jars do. We discussed the possibility of rationing. Perhaps we could set up marmalade alerts on our phones, to tell us when we may start the next jar? It would be like a huge advent calendar of marmalade jars, marking the steps through the year until Seville oranges next ripen in the Mediterranean.